Ever since its launch back in 2011, the Nintendo 3DS has built quite the library, from a 3D remake of the classic Ocarina of Time to the recent installment in the Super Smash Bros. franchise. 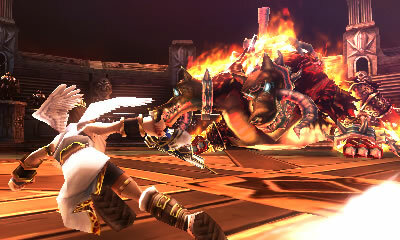 One of its greatest titles arrived to us just a year after its release, and it is Kid Icarus Uprising. 25 years after the original, the angel hero Pit has returned, and he’s better than ever. Unlike its predecessor, Uprising takes on a far more action-oriented approach, as opposed to the franchise’s platforming back in the NES days. You move with the circle pad, aim with the stylus, and use the L button to shoot. Each action is customizable to your desired layout, so feel free to change them if you so wish. I found the controls to work very smoothly myself. The whole chapter always manages to keep you on your toes, and the times you’re not, you may be searching the area for secret areas or even a hot spring that can heal you. There is a lot of variety in gameplay as well. There are nine weapon types to choose from. Heavy damaging clubs, ranged staffs, or speedy claws are just some. Each type comes with distinct weapons, and each of them come with their own effects and power levels. You can even fuse these weapons to make a new one. Powers are also chosen by having them being put down, arranged, in a square, much like Tetris to some extent. Whilst it can be annoying that you can’t have every power you want, it forces you to think rationally rather than being a complete power-house. Each chapter as well feels different from the last. In terms of gameplay, Uprising has excelled due to its tight controls, deep variety, and intense combat. The story is quite enjoyable. Medusa has managed to come back and has decided to rise her Underworld army against Earth. 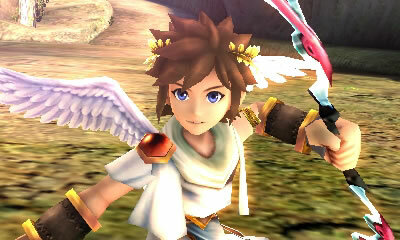 Therefore, it is up to the Goddess of Light, Palutena, and her loyal servant, Pit, to put a stop to it. This may seem really basic, but it is the fantastic dialogue between characters that really make this game standout. As the plot continues, more and more characters are introduced, each with their own personality and style. Despite being silly more often than not, I was always amused by the charming characters and dialogue. And, quite frankly, it is the main reason I have kept going back to replay levels. Uprising looks pretty good from a visual standpoint. No map is the same throughout the massive 25 chapter game, so each area looks different and some stand out from the rest. There really isn’t much to say about the visuals, apart from they look brilliant. However, the game does look pretty good in 3D, especially when you’re viewing some idols (which are basically figurines). In addition, when characters are speaking, a portrait is seen on the bottom screen, and they all look nice and do a great job of expressing the character well. All in all, the game is great to look at. As with any Nintendo game, the soundtrack is great. 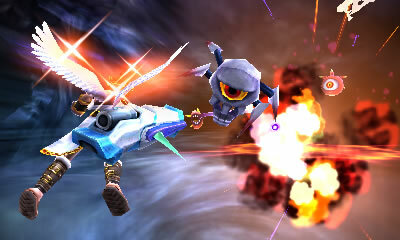 There are many great tracks, from Dark Pit’s theme to ‘Inside the Space Pirate Ship’. The boss battle theme does a great job of getting you pumped to tackle the boss, and the music during the flying section has been perfectly timed to match the events that are happening during this portion of the chapter. Not every song is memorable, though the ones that are will always stay there. Thankfully there is a feature where you can listen to the game’s OST, as long as you have the CDs unlocked. As mentioned above, the game has amazing dialogue. It is made even better by the fact that the voice actors are outstanding at bringing their characters to life. Whether it is Pit’s enthusiastic voice, or how Thanatos sounds a bit camp, there was never a true dull moment, and I never heard any voice being stale. I have only just touched the main story mode. 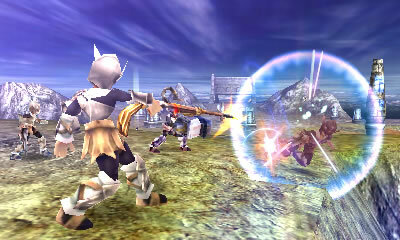 You can also battle in multiplayer battles, be them local or online, which are just as action-packed as the core game. If you’re daring enough, you can try to complete the vast array of challenges that await you to get more goodies and items, or even try the boss rush. But the real deal is within the campaign. With great music, amazing and amusing dialogue, and stellar gameplay, Kid Icarus Uprising has kept me coming back for over 100 hours of gameplay, at least half for the solo mode alone. Kid Icarus Uprising is one of the best titles the 3DS has to offer, and still holds up as one of my favorite games of all time, and it is for that reason I am awarding this masterpiece, with a 10/10. Thanks for reading my first review for VGTribune. I hope to do more reviews like these in the future, as well as other articles. 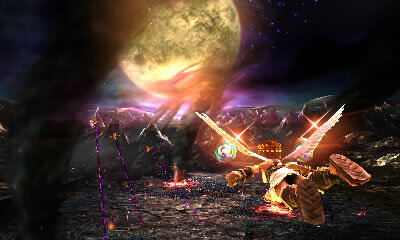 Just as credit, the top picture was from nerdmentality.com, and the other pictures were from the official Kid Icarus Uprising page from Nintendo UK. Nintendo Dads Podcast #220: Happy 2nd Birthday, Switch! Thanks for telling me and the makers of nintindo on how you feel. I am thank full on what people say. So thanks for telling me.